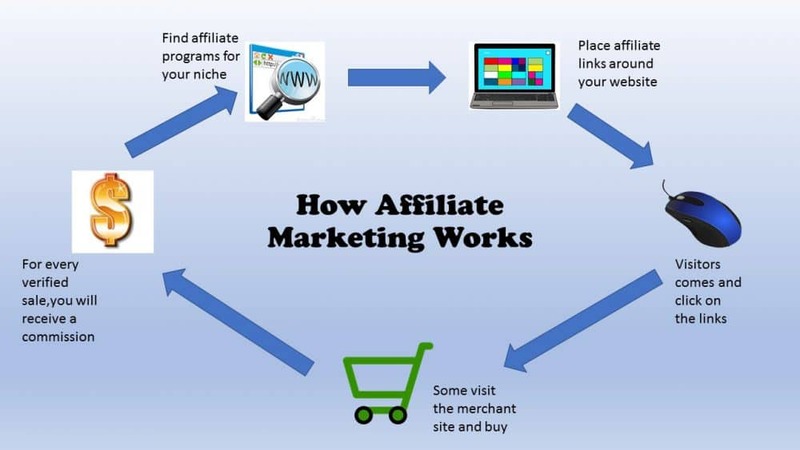 What is affiliate marketing? I can remember the first time I came across the concept of affiliate marketing, it seemed like the ultimate online business model where you could earn huge amounts of money while doing the minimal amount of work. It seemed too good to be true and unfortunately, in my case it was, not because the business model didn’t work, it does but I was introduced to it with all the wrong information. You see, my first encounter with the idea of affiliate marketing was through a digital MLM company, I was taught all the wrong lessons from this company and I never really progressed or fully understood affiliate marketing. I just wanted to make lots of money very quickly and this is what the MLM company told me I could do with their training. 1. Never make it all about earning huge amounts of money. 3. Never get sucked into get rich quick schemes. You see, affiliate marketing is one of the easiest ways to start an online business, you literally just need a decent laptop and a good internet connection to get started. However, please remember just because it is easy to get started, does not mean that success will come easy and this is where you will have to be on your guard against those who try and sell you get rich quick schemes. However,despite all the negative things that have become associated with affiliate marketing, it is still one of the most newbie friendly ways to start an online business. So, what exactly is affiliate marketing? There are many complex explanations around the web, I like to keep things simple. Affiliate marketing is when a company or an individual pays you a commission to generate sales and leads for their products or services. Think of it as a referral system in which the more referrals you send to a company,the more you earn as an affiliate. The concept of affiliate marketing predates the internet age, but the internet is where affiliate marketing took off. With companies looking for more ways to expand their online reach and individuals looking to make money online, affiliate marketing provides a way to achieve both. The Advertiser (Or Merchant) – the company or individual that sells the product/service, could be a Fortune 500 company or it could be a solopreneur. The biggest affiliate program is run by Amazon,they opened up their associate program in 1996 and is usually the go-to network for all new affiliate marketers. The Affiliate – the individual or company that promotes the product/service. Affiliates could be anyone, from large online magazines to individual bloggers also known as solopreneurs. The Consumer – The final destination of the affiliate marketing journey is convincing your target audience to take action which will result in a commission. It is usually good practice for affiliate marketers to let their audience know that they will be compensated if anyone buys something through their link. Some affiliate programs like Amazons require you to do this somewhere on your website. The Affiliate Network – Sometimes companies who want to run an affiliate program will outsource the process to a third party affiliate network. These networks will take care of providing the materials,affiliate links,guidance and even tutorials on running effective affiliate campaigns. They are also responsible for payments to affiliates. Affiliate networks have a massive database of affiliate programs in multiple verticals,to join is free but usually, you will need approval from the merchant if you want to promote a particular program. Yes you can and many people do make a good living from affiliate marketing, some even make over six figures annually. There are many successful affiliate marketers who have documented their journey, many of the most successful affiliate blogs that I visit are listed below. Can affiliate marketing earn you passive income? Yes, it can, but only after you have established yourself. There are no shortcuts in this industry, despite what you may see on places like Warrior forum, JVZOO and Warrior +, you will not become rich within a month by following push button methods. After you have established your website and have consistent traffic coming in, you will start to earn money on autopilot, however, nothing is completely ever passive. You will still need to maintain your website, add content and keep everything updated. Is affiliate marketing a pyramid scheme? No affiliate marketing is not a pyramid scheme,it is a perfectly legitimate system for businesses to attain customers and earn money. However, I do understand why people may think this and this goes back to my earlier point about get rich quick schemes flooding the affiliate marketing scene. It also does not help that MLM companies try and disguise their pay to play recruitment system as affiliate marketing. A general rule in life that will stop you from getting conned is to not fall for get rich quick schemes. Your first task will be to Identify a niche market,this is a very important part of affiliate marketing and should never be rushed. Finding a good niche that is not saturated with established brands or affiliate marketers will give you a better chance at success. In marketing, a niche is simply finding an audience that you could help by providing solutions to their needs. There are many ways to identify a niche,I personally start with keyword research. Carrying out thorough keyword research will give you a good idea of how popular your niche is. You should never go broad when trying to find your niche, for example, if you love sports (like I do), you should never target stuff like football, tennis, athletics etc, these are very broad niches and will very difficult for you to break into. Lebron vs Michael – A debate that is settled with me (MJ all the way) but there are people who think differently. Of course, you will have different passions and interests but I hope you get the idea of how to come up with niche ideas. Another thing to remember is that sometimes you will not find niche opportunities that are aligned with your interests, this is why you may have to broaden your search and look outside of the areas that you are passionate about. Now that you have chosen your niche, it is time to get your website up and running. Don’t worry if this part scares you a little, building a website is probably one of the easiest parts when starting an affiliate marketing business. Gone are the days when it was required of you to know HTML, CSS and a few other web programming languages to build a functioning website. With the rise of content management systems like WordPress (my preferred platform), Joomla, Drupal and others, it has become easy to create websites with no prior knowledge. There are a variety of reasons I prefer WordPress over the other CMS, but the main reason is that it’s very easy to learn. Also, it is free and there are a ton of tutorials to help you get started. You will need a domain name and hosting, a domain is simply your web address and hosting is where your web files will be stored and accessed by you and people wanting to visit your site. Although many companies provide both domain name service and hosting,I always advise people to have separate providers for both. This is because you do not want to be locked down with one host just in case you want to move to a better one when your websites start to attract more traffic. For domain name I usually use Namecheap, they provide one of the cheapest rates for domain registration and also offer one year of free WHOIS guards protection. For hosting, I use Wealthy Affiliate, who provide premium WordPress hosting at a very affordable price. However, if you want a cheaper hosting service I highly recommend BlueHost, they provide good WordPress hosting and are actually recommended by WordPress. One of the many reasons I choose Wealthy Affiliate to host my sites is because they have a fantastic website builder called SiteRubix. SiteRubix is a powerful website builder that lets you easily create WordPress websites with little hassle. You can have a mobile-friendly website up and running in under a minute. Of course, building a website is fun but without high-quality content, there would be no reason for people to visit your site, which brings us to our next task, content creation. In 1996 Microsoft CEO and the Worlds second richest man, Bill Gates, penned an essay titled ‘Content Is King’ in it he predicted that much of the money made on the internet will be through content creation. He wasn’t wrong!! High-quality content is what will drive traffic to your site,it is what people want when they search for a solution to their queries. It is also what Google looks for when they rank websites. You want to establish yourself as an authority in your chosen niche and the only way to do that is through authoritative content. I will be honest with you,this is the most time consuming part of affiliate marketing and if you hate writing (like I do) it can get frustrating. However,if you put in the time and effort to producing high quality content,the rewards will be more than worth it. Before writing any kind of content,you will have to do some research into your audience. There are a few ways you can do this,my favourite is keyword research. Basically, keyword research is finding out what your customers are searching for online, you can then use this information to write your content. There are a few tools both free and paid that will help you with keyword research,I use a variety of tools. For keyword research, I use Jaaxy, which comes free with a premium membership of Wealthy Affiliate. I also use KWfinder,which is a fantastic SEO tool. However,not all niches are the same and you will have to do your own research to see what kind of content works for your niche. When you have found your content ideas, it is time to start producing some high quality articles. There is no point in producing high-quality content if no one sees it, which bring us to our next task, which is attracting your audience to visit your website. There are many methods to do this, one of the most popular ways for affiliate marketers in building an audience is through SEO. Search Engine Optimisation takes a while to see results, but if done properly it can bring you consistent traffic and passive income. SEO is a process of optimising your content for search engines, explaining SEO is beyond the scope of this article,however, I have linked to a few resources that will aid you in better understanding SEO and good SEO practices. Social Media provides ones of the easiest paths to attracting visitors to your site. Unlike,SEO where you have to wait for Google to rank your site,with social media the people are already there. Although it’s good to have a presence on all the major social media platforms,my advise would be to first find out which social media platform best works for your niche. You can find this out by investigating your competitors and seeing which platform sends them the most traffic. After you have mastered one social media channel,you can then move onto the other ones. This is not to say that you shouldn’t have a presence on all of them,you definitely should but do not waste time trying master traffic generation with all of them. If you are good in front of a camera,you should definitely utilise video sites like YouTube,Vimeo and Dailymotion to drive traffic.YouTube is the second largest search engine (behind its parent company,Google) so should definitely think about utilising the huge platform to drive traffic. You also have the option of paid advertising,however I would advise you to only go this route if you have a large budget. Paid advertising takes a lot of testing and if you are not careful you can burn through a lot of money quite quickly without getting a positive ROI. Now that you have a website with a decent amount of content, it is time to find and promote affiliate offers. There are many places you can search, however I always advise new affiliate marketers to start with Amazons associate program. It is easy to get accepted and as Amazon sells nearly everything, there will be something in your niche that you could promote. There is a reason that Amazon is the biggest online retailer and that is because people trust them. So, as long as you can get people from your site to Amazon,a decent percentage of your traffic will be converted into buyers which means more commissions for you. If you do not want to use Amazons associate program, don’t worry there are plenty of other networks, many of which have superb offers and high commission rates. One other piece of advise I want to give is not to stress too much about the commission rate, many new affiliate marketers only look to promote products with high commission rates because that is what they have been told by the gurus.